Skidaway Institute of Oceanography professor Clark Alexander is looking for volunteer scientists to help him assess the problem of marsh wrack. 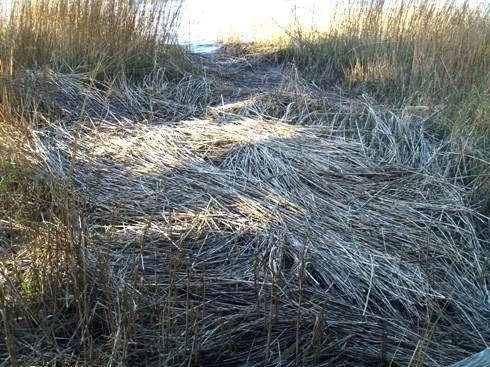 Marsh wrack is the dead marsh grass that forms large layers on top of the water or the marsh surface. Alexander is seeking volunteers willing to identify and photograph sites where wrack accumulates on at least a weekly basis throughout 2011. As part of a grant funded by the Coastal Zone Management program, Alexander is working to assess the distribution and persistence of wrack in salt marshes throughout coastal Georgia. He and his team are using aerial photography to determine how much wrack is present in coastal Georgia and where wrack is found in different seasons. The first step for any interested volunteers is to identify a site they are willing to photograph on at least a weekly basis. Volunteers should have access to a digital camera and an email account, but no other specialized equipment is required. Interested volunteers should send an email to Alexander at clark.alexander@skio.usg.edu. He will provide a specific set of instructions. The last days are always a blur in Barrow. For those of you who have been following this adventure, I didn’t want to leave you hanging. Our experiences from packing to getting home are chronicled below. With all our sampling and lab work complete, Tuesday was spent largely cleaning-up the labs, gathering, cleaning, and inventorying all our gear, and storing it away for our next trip in the spring. It is a large and tedious job, but so important. We need to know that our stuff will be functional (not corroded from the saltwater) when we come back. We need to know if there are supplies we need to replace, and all our gear needs to be organized so that it can be easily retrieved and redeployed. Zac and I finished by around 8 pm and sweaty (yes sweaty) and tired we arrived in time for Karrie’s 40th birthday party. Apparently, for some time plans had been underway for the party which included a cake, decorations, and libations. Everyone was asked to make munchies from food stuff they had hanging around. There were definitely some creative appetizers. I was planning on making instant oatmeal (maple syrup flavored) topped savory rice crackers, but ran out of time. Probably for the best! Drinks were fun too. I had a gin martini on snow. Think adult slurpy. We began our last day by packaging-up our samples and shipping them home. Shipping stuff to and from Barrow isn’t always the most straightforward process since it requires multiple shipping companies that do not always communicate well with each other or us. This time we decided to take our samples (2 liquid nitrogen dry shippers and a 72 quart cooler filled with seawater and humic enriched water) directly to the Northern Air Cargo office located near the airport. They didn’t blink an eye at the unusual and heavy packages and as soon as we tracked down our Fed-X account number (Thanks Tina, LaGina, and Victoria) our samples were on their way. Apparently the shippers were on the ball this time and the samples beat us home, arriving two days later on Friday Feb 4th. Fantastic! On the last trip it took weeks, but that is another story. 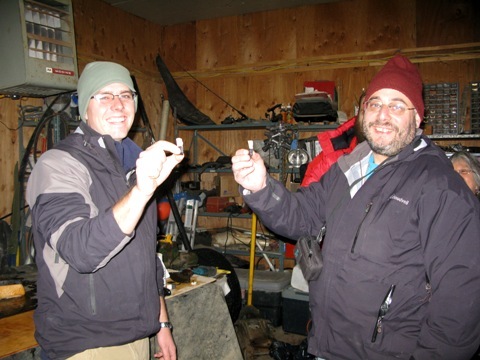 After getting the samples sent off and hanging around the lab, gathering and storing the few hazardous reagents we use and need to keep in Barrow and a few items that need to be stored in a freezer, we headed over to Lewis Brower’s house. Lewis is an Iñupiat Elder, whaling captain, consummate subsistence hunter, and station manger for the Barrow Arctic Science Consortium (BASC). During our previous trips Lewis orchestrated our day to day activities. Lewis offered to show us his home and the preparation of a traditional whale blubber dish called Muktuk (Maktak – Inupiat spelling). 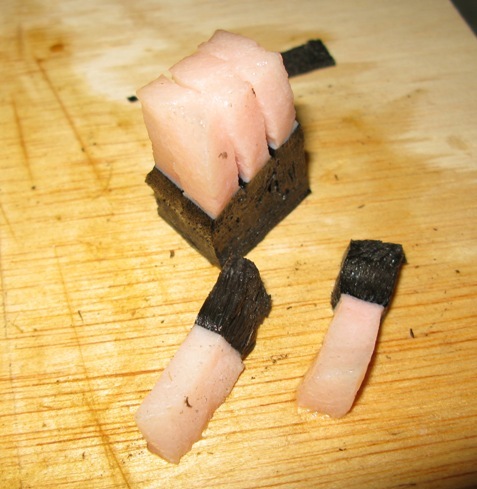 Muktuk is raw Bowhead (or Beluga) whale blubber prepared with a bit of the skin remaining. 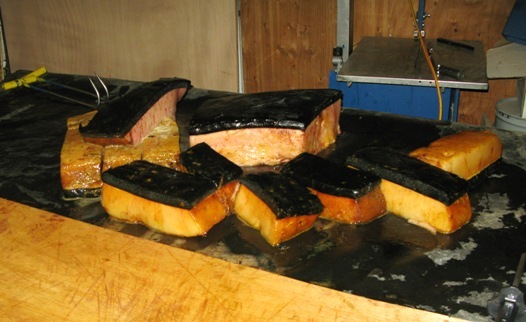 It is usually eaten like sushi with either a little salt or soy sauce and wasabi. As a whaling captain Lewis gets a large portion of a successful hunt and thus is able to share with the entire community. 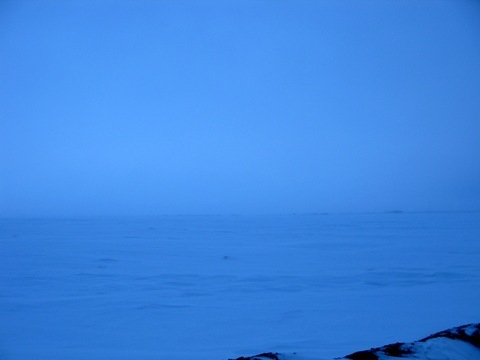 Next week is a Messenger Feast (Kivgiq in Inupiat) which celebrates a successful hunting season. The event is expected to draw as many as 1,000 visitors and most of the 4,200 Barrowites. The festival will be a week long celebration with traditional dancing and drumming and a huge feast. So during Lewis’ lunchtime break, several of us went over to his house where we met his wife (Roxanne) who was also home for lunch and saw where he kept his meat, all his tools and hunting weapons which except for his guns he makes himself. 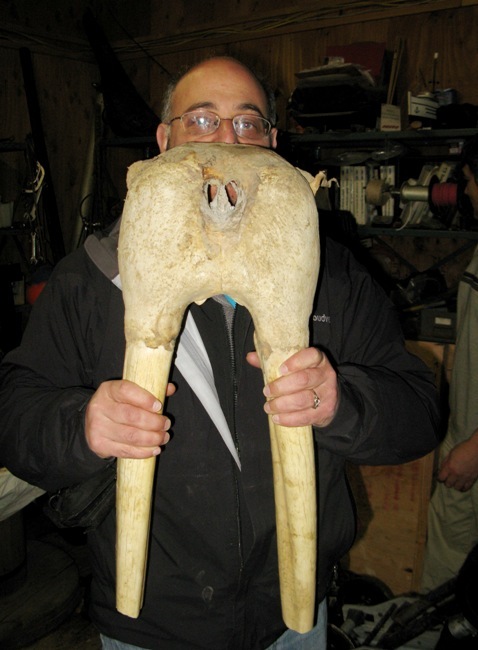 We also saw skins of polar bears and muskox and a skull from a massive Walrus he had battled with (and won). We spent a couple of hours listening to his stories and watching all the while how he prepared the Muktuk. And yes, we even tasted it. I have to say, not bad. Pretty good in fact. It tasted a bit like olive oil to me. Not fishy at all and at 133 calories per ounce it’ll keep you going in the cold weather. We also had a chance to taste dried Bearded Seal meat which was OK, but not as good as the whale. Afterwards we headed home, grabbed our gear and checked in for our flight. We were able to check in early which they appreciate since the TSA officers have to go through each piece of luggage by hand in Barrow. After checking in we decided to indulge in one last meal at our favorite restaurant in Barrow (Arctic Pizza – they serve much more then just pizza) before saying good bye to Barrow for this time and boarding our plane. After flying all night, we finally made it to Seattle in the early morning. I had arranged an extended layover which gave me the opportunity to visit with two retired Skidaway colleagues, Rick and Debbie Jahnke, and to have dinner with a cousin who lives in Seattle. Early Thursday morning we headed to Port Townsend, Washington, where we arrived in time to catch a sunrise over Puget Sound. 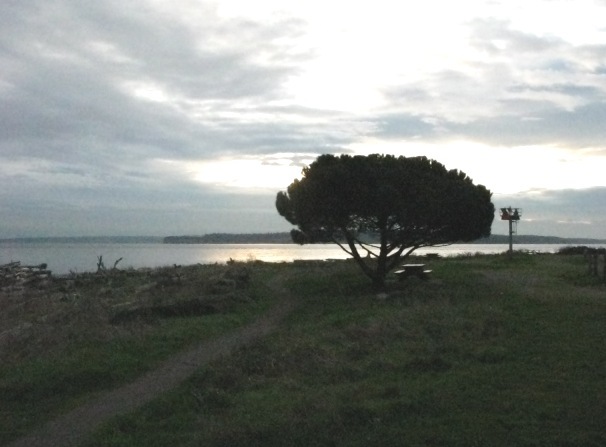 After documenting the sunrises in Barrow I felt obligated to do the same in Port Townsend. Zac and I hung out for a hour or so drinking coffee because we didn’t want to arrive too unfashionably early at the Jahnke’s. They are retired you know. We arrived at their home around 9am and spent a very pleasant day catching-up and visiting some of their new favorite haunts in town. 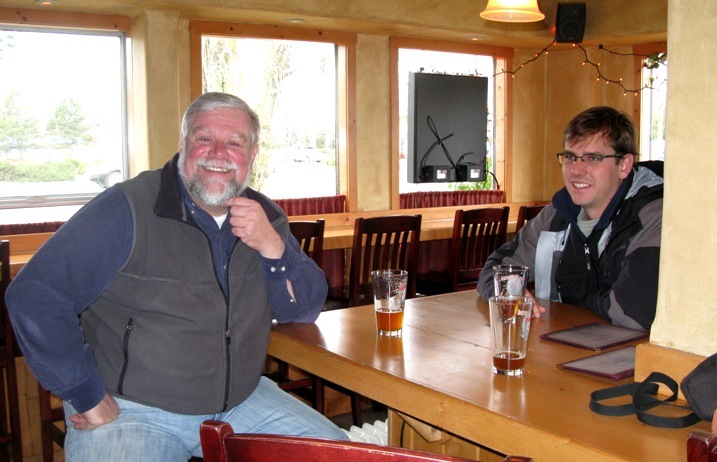 I was especially impressed by the local microbrewery Port Townsend Brewing Co. I had a Winter Ale. That evening the Jahnke’s treated us to a fantastic meal at the Manresa Castle, now a local restaurant and hotel. After such an opulent evening and such a long day, we decided to take a room and simply spend the night. I was asleep by 9 pm — seconds after my head hit the pillow. Very much refreshed in the morning we left Port Townsend and headed to Seattle. We spent the day as tourists at the famous Pike Market and Old Seattle’s downtown, Pioneer Square. It was a good opportunity to shop for a few souvenirs for our families. Not too many shopping opportunities in Barrow and after two weeks away, our families (my wife and son in particular) deserved some nice presents. In the evening we visited my cousin and her daughter for a relaxed dinner and headed to a hotel near the airport to catch a little shut eye before our early morning flight home. Except that it is a very long flight from Seattle to Savannah, the trip was remarkably uneventful. We made it home on time with our luggage. Really a miracle since just a few days earlier most of the country east of the Rockies experienced a major winter storm. In Chicago, where I am originally from, they had two to three feet of snow. Zac’s girlfriend Laurie was there to pick us up and she whisked us both home. Soo extended David’s bedtime, so I didn’t have to wait until the morning to reconnect. Wonderful! In the coming days weeks and month’s we’ll be busy processing all the samples we brought home and that will hopefully help us understand the role of the microbes in the changing Arctic Coastal Ocean and to make predictions about the inevitable changes to come. Stay tuned for the results and our continuing science adventures in the Arctic. With all our samples collected today was spent processing samples and starting the long process of packing up the labs. 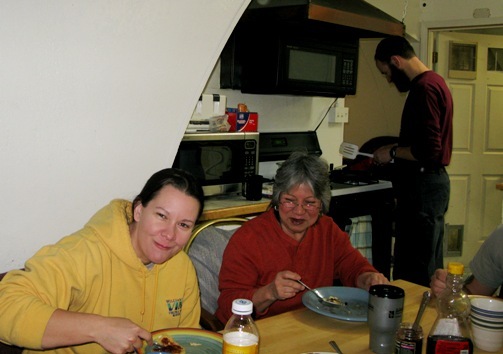 First, the two male students (Steve and Zac) hosted a pancake breakfast at their hut. They earned major brownie points is all I can say. Besides it being an excellent meal, it was nice to be all together to savor a bit the final days of this trip and to inspire us to begin the tedious job of cleaning and packing everything up. It’s so much effort to get ready for the trip; to set-up all our gear; and to collect samples — that it seems almost a shame to be putting everything away. 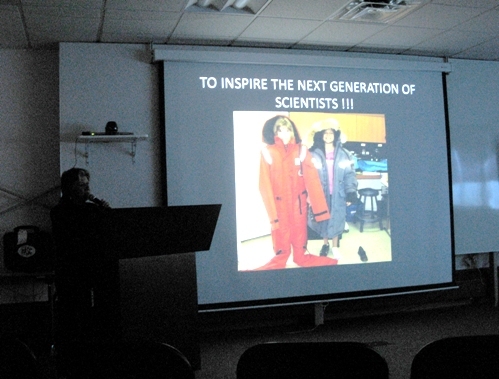 But we got what we came for and now its time to think about getting back to the lab where the real science begins. The sun was above the horizon for a little shy of 4 hours today. As I’ve mentioned before, a remarkable difference given that the sun made its first appearance of the year last week, and then for only a hour. Today, as I was heading east to the BARC lab where we did our RNA extractions and which has served as home base for Zac and me, I almost needed to put on sunglasses. Wow! Not too much else to report right now. 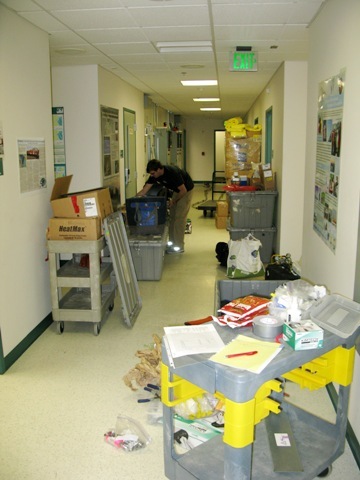 The day was spent gathering all our stuff which was spread across the relatively large NARL (Naval Arctic Research Lab) campus and washing it all. Tomorrow, when it is all warm and defrosted, we’ll carefully pack it up and put it back into storage until we need it again in the spring. Due to a minor communications mix-up between Barrow and Skidaway, this blog entry is out of date-sequence. Sorry. Today we spent most of our day in the lab processing samples, planning for upcoming trips, and discussing our science. 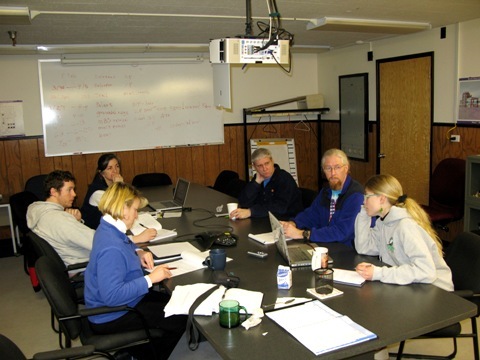 After getting Zac started in the lab extracting RNA from yesterday’s samples, it was off to a meeting with the planning logistics team from CH2M HILL Polar Services (CPS) (Faustine Mercer, Steve Hastings, Josh Bacon, Dominique Fox, and Karl Newyear). CPS is the Arctic logistics provider for the National Science Foundation (CPS) that we work with to make these expeditions possible. 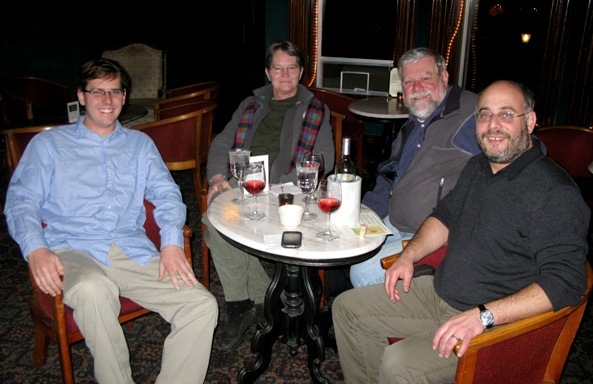 We’re already starting the planning process for our upcoming Spring and Summer trips. The most important decision was to identify suitable and available dates. However, although we’re now completing our third trip and have a good idea of what is needed, we still anticipate another long planning process ahead of the next trip, probably in April, so it was good to get the process started while we were all together. After the meeting and a quick lunch it was time to head to the BARC building where Lollie gave a lecture in the Barrow Community School Yard Program sponsored by the Barrow Arctic Science Consortium (BASC). Lollie presented a truly inspiration talk describing how she has incorporated her experiences as a PolarTREC teacher into the classroom and how the research experiences she has had have profoundly influenced her and her thinking. 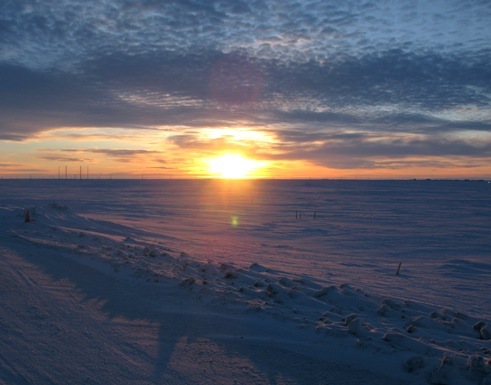 PolarTREC is a US National Science Foundation supported program that facilitates the integration of K-12 teachers into ongoing polar research. I was truly impressed by Lollie’s achievements and message. I think she is going to post the talk on her website so check it out if you are interested (Arcticnitro). After Lollie’s presentation we finished-up in the lab, cleaned-up, and staged all our gear for tomorrow’s field work. If all goes well, tomorrow will be the third and final sampling trip of this expedition. The weather looks like it will cooperate too. Its warmed-up considerably and although most of today the wind was blowing so hard it actually made it feel like -41°F for most of the day and obscured today’s sunrise with blowing snow. By this evening the wind had subsided and it is considerably warmer. Right now it’s a comfortable 2°F with 6 mph winds. Tomorrow the forecast is for temperatures between 5-15°F and 5 to 15 mph winds. Almost tropical in comparison to conditions earlier this week! 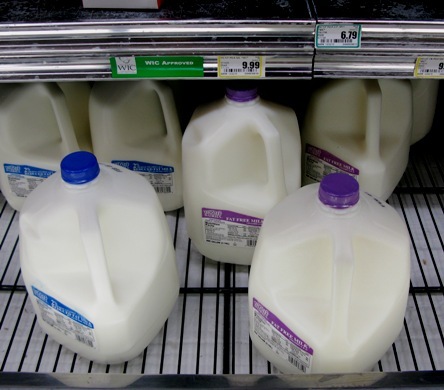 Can you believe a gallon of milk is $10? 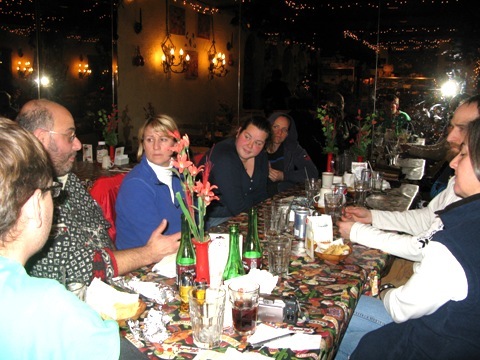 eat dinner and talk science at the famous Pepe’s North of the Border Mexican restaurant, always a favorite of our team. After eating we stuck around for almost 2 hours sharing ideas, discussing our findings, and planning new experiments. I know that sounds geeky, but it really was fun and productive. So, full of new inspiration (and Mexican food) we’re looking forward to getting out on the ice tomorrow.